Summary: Abigail Hunter is mystified and not too happy when she receives her acceptance letter from The Smith School for Children, a boarding school she didn’t know her mom had applied to. She makes friends quickly, though, and is settling in when she uncovers a shocking truth. The headmistress Mrs. Smith is actually a spy, and so is Abby’s mother, Jennifer, who has gone missing. Abby is recruited and quickly trained in spying techniques and self-defense, then sent to California to try to lure Jennifer out of hiding and get the top-secret information she has uncovered. 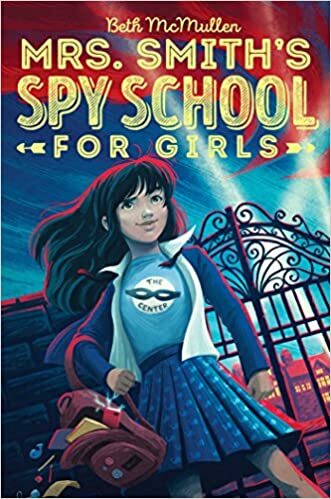 Nothing goes as planned, Abby is kidnapped, the mission is botched, and when she finally returns to school, she is relieved of her spying duties. Determined to find her mother, she recruits her friends to help her, and sets off for their home in New York City. There’s plenty of action and high-tech gadgetry, as Abby manages to free herself from one perilous situation after another and finally reunite with her mom. 304 pages; grades 4-7. Pros: Plenty of humor and action will make this an appealing choice for many readers, who can look forward to book 2 coming out next summer. Cons: You’ll definitely have to suspend some disbelief as you read about Abby’s non-stop escapades in the spy world.